There’s no ifs, ands or buts about it. Opening or closing a sliding door should be simple and effortless. So, if you find yourself struggling with your door because it’s sticking, jamming or jumping the tracks, it’s time to call Door Pros. From the track to the screen to the glass, our repair services at Door Pros will keep your sliding door in tip-top shape. 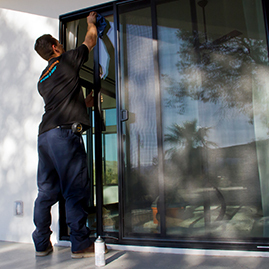 Our sliding door repairs are designed to help residents from La Quinta to Rancho Mirage smooth over their sliding door worries quickly—and at a fraction of the price of a full door replacement. For example, if the glass in your sliding door cracks, we will replace the glass rather than the entire door. Or, if your existing screen door becomes damaged, we can repair your screen door with new screen mesh and more. If you find yourself in a sticky situation, do yourself, your budget and your peace of mind a favor and schedule a sliding door repair with Door Pros. 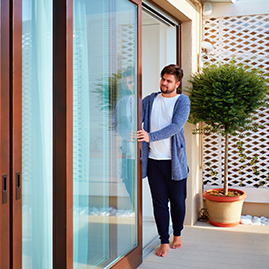 You should be able to open and close your sliding door with the flick of your finger. If you find yourself playing tug of war with your door, slide on over to Door Pros. 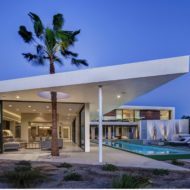 Our company offers sliding door repairs in Rancho Mirage and the surrounding areas for screen, glass and automatic sliding doors. Serving as a more cost-efficient alternative to a sliding door replacement, this service is designed to get your door back on track quickly (and keep it there) while remaining in line with your budget. Rollers, installed on either side of your sliding door, make it easy for you to open and close your door. So, if your door happens to get stuck or it becomes more difficult to maneuver, chances are there’s a problem with the rollers. From cracks to bends, damaged rollers have to be replaced. But the problem may be simpler than that. You see, mud, food, hair or dirt can get stuck in the track or the rollers and obstruct the door’s movement. If a dirty roller is the problem, all it takes is a thorough cleaning. If the screws holding your rollers become loose or fall out, it will cause your sliding door to jump out of the track, thus moving the whole door out of alignment. Unfortunately, you won’t be able to open or close your door until this problem is fixed. Damage to the bottom track of your sliding doors can cause an array of problems. Are you noticing waves, divots or dents in your track bead? This is caused by worn out rollers. The fix involves installing a cap over the damaged bead and filling in the divots, creating a smooth, dent-resistant surface. Is your track bending? From inward (toward the floor) to outward, a bent track will prevent your door from moving all the way on the track or cause it to jump off-track. Fixing a bent track requires pulling or pushing it back into place. But to ensure you don’t damage your door, let our professionals help. If the track is severely damaged, a sliding door repair might fail to do the trick. In this case, our professionals will help you remove the old track and replace it with a new one. 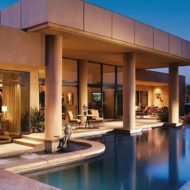 Because of broken seals, weather, sand, pests or a burglar, your sliding door glass may crack or shatter. For your safety, don’t attempt to replace this broken glass on your own. Our professionals have the expertise and skills to properly replace the glass in a timely and secure manner. When the Going Gets Rough, Turn to Us! Don’t waste time fighting with a door that’s difficult to open or close. Instead, give our smooth operators a ring today to schedule your sliding door repair!